The Elegance Coral is one of the most beautiful corals available! The Elegance Coral Catalaphyllia jardinei has been one of the most popular large polyp stony (LPS) coral. This is because it is extremely attractive. It comes in several different colors, and usually has bright pink tips that glow under blue or ultraviolet light. Colors can be fluorescent green with cream tentacles, brown and lime green with blue, orange or purple tipped tentacles, and more. Some colors like lime green are thought to help in UV protection. The C. jardinei is a widespread coral found in many diverse habitats. In the wild, the Elegance Coral lives in both shallow and deeper waters, down to 131 feet (40 m), in areas of gentle turbid water. They can be found attached on hard patch reef substrates, where they tend to grow larger, or free-living on soft substrates. Their cone shaped, wedge-like skeletal structure allows them to bury into the softer substrates. In the ocean they are usually collected from soft sand or silt substrates, sometimes for areas where sea grasses frequently intertwine with their tentacles. Throughout the 1980's and into the 90's, the Elegance Coral was considered easy to care for. Unfortunately, sometime in the late 1990's some specimens began entering the trade that were doomed by a condition that had no known cause or cure. Eric Borneman, in his 2008 article Elegance Corals: Sustainability and Disease Impacting Catalaphyllia jardinet (Wells 1971) in the Aquarium Trade, refers to this as "Elegance Coral Syndrome (ECS)". Just about all Catalaphyllia the aquarium trade come from Indonesia, but a small number do come from a few southeast Asian nations and Australia has recently begun to export the species as well. The ECS condition is contagious, but it does appear to be specific only to Catalaphyllia. Borneman says that the "disease causes the colony's oral disk to swell, with a fringe of unexpanded tentacles." The signs of disease contagion ranges from a few days to a few weeks. Then it takes several weeks or months to kill a colony. The ECS condition has continued today making these corals extremely difficult to care for. Success in keeping a C. jardenei in captivity depends on a few necessary components. Ideally obtain specimens cultivated in captivity that have never been exposed to specimens with ECS. Unfortunately captive bred corals are not common and most available specimens will be collected from the wild. Borneman suggests that "the most effective solution is to quarantine or isolate all collected or purchased Catalaphyllia from all other Catalaphyllia for at least one month, to ensure that the disease is not present." In the aquarium, strong currents are not appreciated by the C. jardenei, but some water movement is required. Place the base on soft sand away from rocks. Position the coral far away from all other organisms as contact with any algae, caulerpa or soft corals, as well as many other LPS will cause tissue recession and death. This coral sends out sweeper tentacles that can be quite strong. They will expand a surprising amount so leave plenty of room (at least 6 inches) around this coral. It also requires medium to strong light. Direct metal halides will burn the tissue, but diffused moderate light is appreciated. They can be fed occasionally. Foods 1/4" (6 mm) or smaller will be eaten greedily and will sustain the coral. Larger pieces will be accepted by the coral, but will later be regurgitated. Meeting all these requirements will provide the necessary habitat to provide you with a healthy Elegance Coral that will live a long life. This video is great in that it gives us a really good view of the underside of the Elegance Coral and shows a variety of colors. Captive bred corals, and specimens that are not infected by ECS can be moderate in care. Good gentle, yet turbid water flow, out of direct metal halide lights, and almost daily feedings of finely minced food will contribute to their success. Make sure the tentacles are nowhere near live rock where they can be abraded and cut. This will lead to tissue damage and brown jelly infection. They will host some clownfish like the "any port in a storm," Ocellaris! Catalaphyllia Coral Information: The Elegance Coral Catalaphyllia jardinei was described by Saville-Kent in 1893. Other names this coral is known for are Elegant Coral and Wonder Coral. The C. jardenei has not been propagated successfully in captivity, yet has budded under optimal circumstances. These corals are not hermatypic, which means they do not contribute to reef structures or reef growth. Where Catalaphyllia Corals Are Found: C. jardinei are found around Australia on the Great Barrier Reef and Dampier Archipelago. They are also located near Japan and then from Mozambique to Vanuatu. Catalaphyllia Coral Habitat: The C. jardinei live at depths down to 131 feet (40 M) or shallower in lagoonal and inter-reef areas of gentle turbid water. The substrate they like to bury into is soft and often muddy, with sea grasses often intertwined with the tentacles. They will share space with fungiids and other lagoonal inhabitants. The C. jardenei has very strong stinging tentacles to help capture small prey and to defend themselves against predators. The C. jardinei is not on the IUCN Red List of Endangered Species. There is a concern about collection of these corals, as being easy to collect can contribute to over collection. Also in later years, the need to travel out further from shore to obtain specimens adds to travel time, which in turn adds to a poorer survival rate. What do Catalaphyllia Corals look like: The Elegance Coral C. jardinei has a cone shaped, wedge like skeletal structure that makes it easy for them to bury into soft substrates. The bottom is pointed, yet the top where the fleshy polyp is located is very wide with pointy, thin, bone like divisions called septa. The septa forms V shaped valleys. 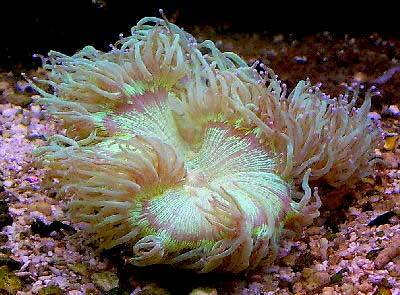 The polyps have long thin tentacles with contrasting tips that can also be bulbous in some specimens. Their fleshy, large oral disc has several mouths over the "valley" of the septa. Colors can be fluorescent green with cream tentacles, brown and lime green with blue, orange or purple tipped tentacles. and more. Some colors like lime green are thought to help in UV protection. As an interesting side point, marine author Scott Michael photographed black and blue color morphs, indicating there may be many more color combinations in the ocean. The C. jardenei usually reaches about 12" ( 30 cm) long x 8" (20 cm) wide. When feeding, the individual tentacles can extend 4" (10 cm). Lifespan is unknown. Catalaphyllia Coral Care: The C. jardinei can be moderate to difficult to care for. Most available specimens in the trade are collect from the wild and many will have contracted Elegance Coral Syndrome (ECS). These infected corals are doomed by this condition, which has no known cause or cure. The condition is contagious, but does appear to be specific only to Catalaphyllia. It is characterized by the oral disk to swelling and a fringe of unexpanded tentacles. Captive bred corals, and specimens that are not infected by ECS can be moderate in care. Providing correct lighting, good gentle, yet turbid water flow, a good location, and almost daily feedings of finely minced food will contribute to their success. Make sure the tentacles are nowhere near live rock where they can be abrased and cut, since this will lead to tissue damage and brown jelly infection. Avoid direct metal halides, unless it is highly diffused. Elegance Corals with brown pigment are generally healthier and easier to care for. Translucent and clear specimens have already expelled most of their zooxanthellae and will not survive long. If your lighting is aging and dull, the Elegance Coral will expand its tissue to try and absorb light. This polyp expansion is not an indication of growth, but an indication your lighting is too low or old. Measure its skeleton when you acquire your C. jardenei and then again 6 months later to ascertain actual growth. Catalaphyllia Coral Feeding: The Catalaphyllia corals, like other large polyp stony (LPS) corals, have developed several feeding strategies. Through a symbiotic relationship with a marine algae, known as zooxanthellae, they receive many of their nutrients. They also capture planktonic organisms, food particles from the water column, and can absorb dissolved organic matter. In captivity, these corals are hungry all the time, so feed as needed with various types of foods for optimal health. Never feed your C. jardenei foods that are any larger than .25" (6 mm). Try mysis, krill, brine shrimp and other smaller items. You can also mince a small fish or shrimp into very small pieces and feed the entire organism to your Elegance Coral, since different parts of the animal have varying nutritional qualities. Just be cautious, placing a whole fish or shrimp does result in the animal's grabbing the food, but late at night it is regurgitated. This results in eventual starvation, starting with tissue recession and onset of possible disease. The C. jardenei does eat a lot of food, but it must be the proper small size of 1/4" or smaller. A well-feed live rock/reef environment is what is needed for your Elegance Coral, along with some fish for organic matter production. Have an open area with soft sand substrate. A mature tank is recommended. Be sure to have proper water movement. Water flow that is too strong can cause the polyps to not extend properly thus inhabiting their ability to capture food. Provide sufficient lighting, they enjoy indirect bright light. Do not place directly under metal halides or its polyps can be damaged, which can lead to rapid tissue necrosis or RTN. Make sure that no other corals can come in contact with your Catalaphyllia. This coral can be aggressive, so leave plenty of room (at least 6 inches) around this coral. Marine Lighting: Moderate and diffused light, but no direct metal halides. Catalaphyllia corals can be aggressive if touching other corals, so leave plenty of room (at least 6 inches) around this coral. The Elegance Coral has very few compatible neighbors. They are sensitive to being touched by algae, especially caulerpa, as well as any soft corals. Others in their family, such as the Anchor Coral Euphyllia ancora will dominate and damage the Elegance Coral. Even a small polyp stony (SPS) coral which is not an aggressive coral, such as the Elephant Skin Coral Pachyseris rugosa, can cause damage to the Elegance Coral. Keep clownfish away from your Elegance Coral, as the constant wiggling of the fish will cause the coral to not expand and will eventually stress it to death. Bristle worms too, can irritate their flesh and cause infection as well. C. jardenei can ensnare and sting small fish, especially those without swim bladders that tend to "fall" from level to level in the aquarium. Do not house them with Mandarin Gobies. The Mandarins eventually bump into the tentacles of the Elegance Coral as they look for benthic foods, causing them to be stung and die over several days. This is not a pleasant thing to watch. First welts develop and swell as poisons from the sting slowly kill the victim. The large polyp stony (LPS) corals are male and female and can reproduce both sexually and asexually. In the wild they reproduce sexually by releasing eggs and sperm at the same time, resulting in a fertilized egg which then forms into a free-swimming planula larva. Eventually the planula larvae settles onto the substrate, becoming plankters. This then forms a tiny polyp which begins to excrete calcium carbonate and develops into a coral. Planula larvae are extremely vulnerable to predation, and very few survive. Catalaphyllia genus reproduce asexually as well. The C. jardinei has not been propagated successfully in captivity, yet has budded under optimal circumstances. Physical propagation should not be done. Cutting into the tissue will result in damage that can lead to disease. It is best to feed them well and keep them happy. In optimal conditions, they may form buds which can be harvested. The Catalaphyllia spp. are fairly hardy, but are susceptible to a few maladies. The C. jardinei is susceptible to brown jelly or protozoan infections, intense lighting, and as a new specimen. Currently virtually all that are collected from the wild and sold in the aquarium trade have contract the ECS disease and they are doomed. There is no known cause or cure and the ECS condition is contagious, but it does appear to be specific only to Catalaphyllia. Borneman says that the "disease causes the colony's oral disk to swell, with a fringe of unexpanded tentacles." Quarantine all new specimens for at least a month. The signs of disease contagion ranges from a few days to a few weeks. Then it takes several weeks or months to kill a colony. Try to treat the coral with the least stressful method first. Place in a quarantine tank until coral recovers. In worse case scenarios, the ill polyp should be cut off from the rest of the colony. Do not place directly under Metal Halide, or the C. jardinei's polyps can be damaged and can lead to rapid tissue necrosis or RTN. Julian Sprung suggests putting your new Elegance Coral in a well aerated and heated 10 gallon quarantine tank with Doxycyline at 50 mg per gallon. Do not use a light during this time, since this medication is photosensitive. Keep the coral in the tank for 3 days and this will help kill any possible bacteria. One other preventative is using Nitrofurazon at 25 to 50 mg per gallon for 3 days. Catalaphyllia Corals for Sale: The Elegance Coral C. jardinei is available at pet stores and on line and moderate in price, depending on size and/or color. the info in this article is outdated and wrong. the LAST place you should put an elegance is 'buried' in the substrate, oriented upwards. elegances do NOT grow w/ a vertical orientation in the wild. AND, due to the 'elegance coral disease', it should NOT be attempted by relatively new hobbyists. it's an expert level coral only, and has been, since the early '90's, due to the rampant spread of 'elegance coral disease syndrome'. elegances should be oriented SIDEWAYS, off from vertical, prefferably on rock. Thanks for bringing the current data about the Elegance Coral Syndrome (ECS) that is affecting this coral to our attention! We have updated the page to reflect the Elegance Coral Syndrome with information and a link to Eric Borneman's 2008 article describing this challenging disease and its effect on keeping an otherwise moderately easy coral. As far as the orientation of the coral, this species has a wide distribution and can be found attached to rock structures with an the orientation you describe, but it is also found free-living on soft substrates, so can be oriented in a soft substrate just as well. i want to say this coral truely is an awe inspiring animal. When I first purchased mine it was a goner the store was ready to toss it in the trash. Many of these corals don't fair to well on the way to the store. There was almost no tissue left. It was all retracted and pulled away from the skeleton. I nursed this coral back to health unker 250 watt 10k hqi metal halides. I had it placed in the sand bed. I was amazed at the colors it displayed. It was a pinkish green splash with intense neon pink tips,under actinic lighting it flouresenced like it was radioactive.the elegance loved eating mysis shrimp and larger peices of raw cocktail shrimp. They have many mouths. The elegance is truely amazing. I read that they are collected in lagoons,where there is a higher nutrient load. I guess mine enjoyed being in with 17 fish. The sting of this coral is extremely intense they can actually be used to place against an aptasia and kill it. Nature with all its complexities never cease to amaze me. I didn't know about this and I am interested. Thank you. What is stated in the above description may have been true years back, but not the case today. I would say these corals should only be attempted by experienced reefers, not beginners. Furthermore, there are more and more reports that indicate these corals do much better under low to moderate lighting and metal halide is definitely NOT recommended.